You will be treated as a Blessing at Casa de Megumi with friendly greetings and all the help you need for your vacation. Megumi is a Japanese word, which means blessing, abundance, and grace; that is how you will be treated here. Casa de Lantana is surrounded by gardens and has a large roofed patio where you can eat, work, and take a nap in a hammock. A different way of life and being! Our vacation rentals are located in a 6 acre tropical property filled with various kinds of tropical flowers, plants, and mature trees. You will be able to watch more than 50 kinds of birds, animals, and soul-touching far-away ocean views and sunsets from the office in Casa Grande. You will be staying at a completely fenced and gated property for your privacy and security. Our pool is always sparkling clear and well maintained for your enjoyment. And, you can park your car in a large parking lot saved for our guests. Friendly housekeeping, maid services, laundry services, authentic Costa-Rican food, massage therapies, and professional coaching sessions are available with advance requests. We understand how important high-speed Internet or WiFi is to our guests. Thus, it is offered to our guests as a complimentary service in all rental units: inside and outside of the units as well as at the pool side. Your desire to be connected with your loved ones and your business is understood and respected in our place. For your adventures, various kinds of tours can be arranged: volcanoes, hot springs, beaches, canopy tours, white-water rafting, butterfly gardens, orchid gardens, coffee plantations, hiking, Cloud Forest, famous churches, flea markets, museums, San Jose, Escazu, and other tourist spots. We are only 3 miles from Atenas, which has many restaurants, supermarkets, medical and dental offices, banks, the post office, and many other places you need for ordinary living. Atenas has many retirees from the U.S., Canada, and Europe and is known to have a very active, supportive expat community which is not found elsewhere. Many of our guests are retirees, young parents with young to school-age children, and some others are location-independent professionals who work online from our place. We understand both their needs. If you are looking for a laid-back, relaxing, affordable and beautiful accommodation for your adventurous vacation or for your online professional work in Costa Rica, yes, you are at the right place! Welcome Home at Casa de Megumi, where you will be treated as a BLESSING! Keywords: Casita, casa, condo, suite, bedroom, with a kitchen, hot-water shower, high-speed Internet, WiFi, pool, fenced, gated property, convenience, downtown Atenas, guest house, retiree, tour, adventure, vacation rentals, WiFi, apartment, rental rooms. Because of the world's best climate and beautiful sunset scenery from Casa Grande in a 6-acre lot, in a very friendly Tico neighborhood. This was exactly what we wanted, after having traveled to many places in Costa Rica. This is one of the most beautiful, friendliest, and safest places we have been to and at the same time it is close to all major facilities we may need, such as the major airport, good medical facilities and international malls, especially since we now have a new highway directly to San Jose and Escazu in only 25 minute driving or to the beaches on the Pacific Coast. You can relax and work at the same time here with the pool and high-speed Internet connection inside and outside of the rental units and around the pool. Both complimentary. You will be welcomed just like when you are going back to your hometown, where everyone treats you like their own family members. From this location, you can go to anywhere by bus easily. Each unit/room at Casa de Megumi has a full bathroom with hot water. We are only 3 miles away from Downtown Atenas, where you find many restaurants, bars, banks, supermarkets, clinics, massage therapist, etc. To the closest beach, it takes only 45 minutes on highway, so you can have a day trip there. We are between the villages of Rio Grande and Balsa. Surrounded by tropical flowers, plants, and trees. From the main casa grande where office is, you can see a far-away ocean view with great sunset. Yes, at Casa de Lantana has a local phone. Casa de Lantana and Orchid Room includes all lines and weekly lines changes and cleaning. At Casa de Megumi site, we offer "Laundry Service" or they can use the washing machine (soap provided) for $3/each load. We offer "Laundry Service" dried by the dryer. Yes, each unit has a designated parking space in the open area withing the gated property. Yes and they are changed on a weekly basis. 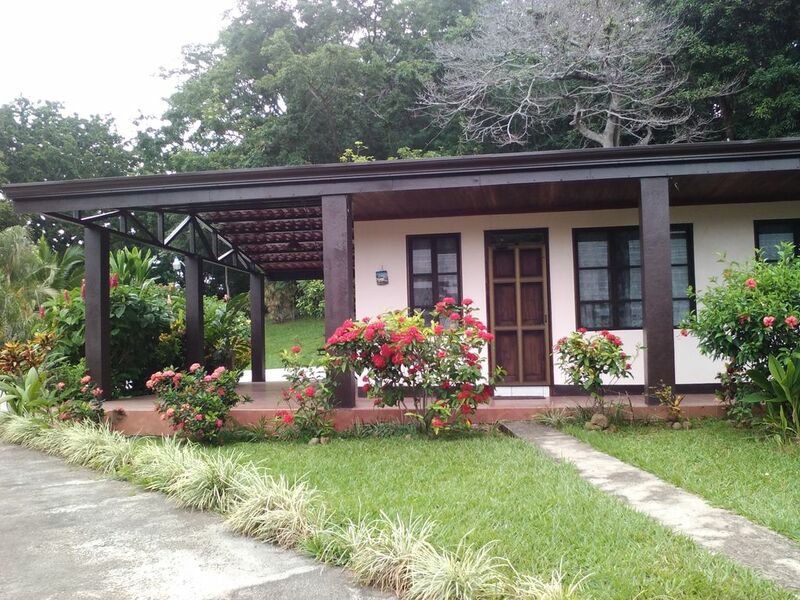 Casa de Lantana has a living room as well as a roofed patios where most of us spend relaxed time here in Costa Rica. Yes, each pf Casa de Lantana and Orchid Room unit has a fully equipped kitchen and all necessary items. Yes, each of Casa de Lantana and Orchid Room unit has a fully equipped kitchen and all necessary items. Yes, each of Casa de Lantana and Orchid Room unit has a fully equipped kitchen, refrigerator, oven, microwave oven, pans, pots, dishes, glasses, cups and all other necessary items. Dining area is located in the living room. At Casa de Megumi there are books to borrow. The owner/manager takes care of the gardening/lawn, and each unit is surrounded by beautiful tropical flowers, plants, and trees which are maintained well. All units have a separate roofed patio. Within 20 minutes, you can go to play tennis. Within one hour drive, you can go play golf. At Casa de Megumi, there is a deep pool for our guests who are staying at our 3 units. The pool size is 4 meters by 8 meters and the depth is 3 feet to 7 feet. There are so many things you can do, having our place as your base: coffee tours, going to nearby beaches, visiting hot-springs, cloud forests, butterfly gardens, orchid gardens, many historic churches, San Jose downtown, craft town Sarchi, water falls, ocean adventures, Canopy tours, white-water rafting, and having your relaxing massage at home. Great introduction to living like a resident or ex-pat. Superb hostess! The two bedroom cottage we stayed in for three weeks was very nice, well equipped, spacious, and private. Lovely patio with a hammock and Costa Rican rocking chairs. Being close to the road there is traffic noise at certain times. On the plus side we were very close to the bus stop going into Atenas. Cost about 80 cents. In the main area of the compound which was a 3 minute walk is the swimming pool, other apartment and where Hisano lives. The pool is fairly deep with a small shallow end, warm and well maintained as is the patio around it. Our hostess, Hisano, was extremely helpful in many ways. We had a problem with our shower, told her, it was fixed immediately. These are the things you expect. What you don't expect are the rides into town, the tour of the town, the trip to the grocery store and help figuring out what things are etc. The six acre property has many trees and plants, and fruit trees which Hisano very generously shares. She is also very generous in sharing local knowledge, about tourist attractions, tours, local towns, transportation, activating cell phone plans etc...everything to make you feel more comfortable. We were well served by buses and taxis which are very reasonable cost wise. We had a wonderful 3 weeks and were sorry to see it end. Thank you so much for staying at our place. We look forward to having you again in the near future. Until then, we will be taking care of our rental units, as well as flowers, fruit trees, and plants, so you will be able to enjoy more of their beauty and bounty next time. Casa de Megumi is Pura Vida indeed! Casa de Lantana was a perfect place for my "working" vacation. The accommodations were comfortable, clean and in excellent condition, and very secure! The walk down to the main house for the pool was relaxing and scenic, as the landscaping which has been done on the property just made you realize how much Costa Rica has to offer. The views of the mountains and the setting sun in the evenings were just so relaxing. BUT, the one thing that made this stay PERFECT, is the hostess, Hisano! From my arrival to departure, she invested herself in me, my son when he visited for a week, and the other guests who were there in the studio apartment located nearer to her Casa Grande. She ensured I was able to get groceries the day I arrived, took me into town to show me how to navigate the area, pointed out places of interest including good restaurants, and explained the bus (the bus stop is right across the street!) and taxi system since I didn't rent a car for the whole 5 weeks I was there. She even arranged a car for the week I needed one, and that was seamless! Not to mention hosting a dinner, meeting some expats who have retired in Atenas, and a trip to a concert were special highlights of my stay. Now, Atenas itself is not a "tourist vacation getaway" but a place where many expats and retirees have decided to make home. With its proximity to San Jose, the area has more than a beach town would have available to you. So, you actually get a feel of what it is like to truly experience living in Costa Rica. It is close enough to get to places like Arenal, La Paz, the beach at Jaco, and an wonderful coffee tour right on the outskirts of the town of Atenas (and I highly recommend going there!). Be advised, you are staying in a true residential area. There are neighbors with barking dogs and you will hear some truck traffic. But you will be very secure, as Hisano has ensured that to be extremely important. If you want a relaxing stay, in an area that is not "touristy" but really want to experience real Costa Rica, there is no better place to stay but with Hisano at Casa de Megumi. A true blessing it was to be here and you will gain a wonderful friend at the same time! We stayed with Hisano for almost 2 weeks. Hisano showed us around town, introduced us to ways of life in Costa Rica and to new friends! We traveled by bus mainly, which was very convenient from this location with the occasional taxi which she helped to arrange for us. The grounds are well maintained and the living quarters clean and updated. There are fans in the room and plenty of air flow. Temperature was just right, we didn't need air conditioning. We stayed in the Orchid Room, right next to the swimming pool which was convenient for cooling down as needed! The place is very secure and we always felt safe. There is road noise and barking dogs at night that made it challenging for a light sleeper like myself. Nonetheless, Hisano is a 5-star host in Atenas! We highly recommend this stay! We chose this retreat due to its equal distance from San Jose and the coast. Each is no more than an hour away by bus (stops just outside the gate) or by car. The house is private and separate from the main house which is maybe 100 meters up the paved drive. Our hostess, who speaks English, Japanese and Spanish fed us the first night and showed us around town the next day in a whirlwind tour that included the best grocery. Security of the compound is paramount. The main house has tremendous views of the mountains with the Nicoya Gulf in the distance. Grounds-keeping is top notch and very lush. The climate was mild and the windows remained open throughout the day and night. Web service was reliable but slower than most US networks. There's no TV. This is a vacation, right? Another couple was there (very pleasant) and had returned over a period of years. I can see why. I'll go again. For those who want an environment where you're immersed in language and culture this is the place. Definitely a tropical Haven Away from Home. Hisano is an amazing hostess! She was a great 'Mom', terrific sense of humour, made us feel comfortable, involved us in local socialization. activities & culture &, organized an educational, interesting coffee tour. She & Tela arranged for us to participate in a Latino dance, what we Canadians would call a 'barn dance', with a live local band. We discovered that Hisano is also a fun loving, entertaining dancer! A once in a life time adventure that followed, was to participate in a 2.5 km trail ride, with the Ticos, on dancing horseback. We were fortunate to be in the right place at the right time with the right hostess. Tela demonstrated how to harvest coconut water from trees in the yard. Yum, yum. Hisano helped us learn about local currency & was very concerned about our safety & health, ie) supplied purified drinking water. Hisano introduced us to the Farmers Market with absolutely delicious fresh fruits & vegetables so we could eat lots & yet loose weight. We learned about a 'balanced diet'!!! Her back yard has fresh lemons, oranges, avocado, pineapple, mango & a variety of medicinal herbs.This was a great place to spend our first week, of our four week vacation in Costa Rica. It helped to ground us as we adjusted from the Canadian cold. The property was kept clean with beautiful greenery & exotic flowers. The kitchen is fully equipped. The hammock is perfect for siesta, rest, relaxation, listening to birds & reading. The swimming pool was kept immaculate with slow release chlorine system. The climate was perfect. Daytime was warm, but comfortable, evenings were cooler for sleeping & there was always a refreshing breeze, night or day. There was no need to rent a car because the bus stops across the street. The bus driver even remembered where we got on & dropped us off accordingly. Behind the bus depot were amazing fruit & vegetable stands. We were surrounded by very friendly, happy people & happy roosters! We have more than 50 kinds of birds in our property to see and the following can be arranged: bird-watching tours, zoo and butterfly garden tours, La Paz waterfall garden and volcano tours, coffee plantation tours, museums in San Jose, beach trips within an hour, canopy tours, art and craft tours, tropical garden tours, Orchid Garden tours, hot-spring tours, etc. Rates are subject to change until a reservation with the deposit is made. An additional $30.00 is required for departure cleaning fee.